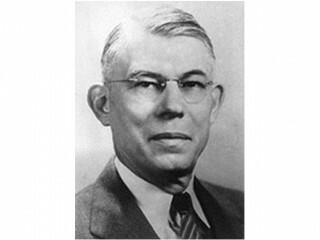 Edward Adelbert Doisy (November 13, 1893 – October 23, 1986) was an American biochemist. He received the Nobel Prize in Physiology or Medicine in 1943 with Henrik Dam for their discovery of vitamin K (K from "Koagulations-Vitamin" in German) and its chemical structure. Doisy was born in Hume, Illinois, on November 3, 1893. He completed his A.B. degree in 1914 and his M.S. degree in 1916 from the University of Illinois at Urbana-Champaign. He completed his Ph.D. in 1920 from Harvard University. In 1919 he accepted a faculty appointment in the Department of Biochemistry at Washington University in St. Louis where he rose in rank to Associate Professor. In 1923, he moved to St. Louis University as Professor and Chairman of the new Department of Biochemistry. He served as Professor and Chairman of that department until he retired in 1965. St. Louis University renamed the department the E.A. Doisy Department of Biochemistry, in his honor. More recently, the department has again been renamed. It is now known as the E.A. Doisy Department of Biochemistry and Molecular Biology. He also competed with Adolf Butenandt in the discovery of estrone in 1930. They discovered the substance independently but only Butenandt was awarded the Nobel Prize in Chemistry in 1939. View the full website biography of Edward A. Doisy.